But unfortunately, people are so fond of spam, and same thing happens on it alot. So I needed to delete a few fake and spam created groups in buddypress but took me a while to figure out how to do it. To delete the group in buddy press, simply goto the wordpress site front end (not wp admin backend) and browse to the group. Open the group and you will see a link appear in the top bar saying “Admin Options”. here you can manage the buddypress group and group settings, edit its details, change group avatar, manage invitations, manage members and at last delete the group too. 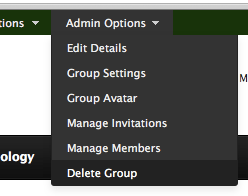 This this image showing “delete group” option for buddypress groups. However you will have to keep looking for groups created (or assign a moderator to do so) to avoid spam again. What techniques do you use to combat spam group creation in buddypress for wordpress ?